Well if anything good comes out of seeing a movie like 2012, its a great opportunity to prove that I do not like every movie I see. Since I'm pretty discriminating about what I see, you will find that I like most things I review. This one came with a guarded feeling. I got a strong feeling that it would be a typical Roland Emmerich piece of beautiful garbage, but some respected critics like Ebert, had some nice things to say, and if all else was lost I was sure to see a spectacle of technical effects. Our local cinemas have recently been upgraded to stadium seating and digital projectors, so I was hoping that 2012 was a nice opportunity to test out the limits of our new digs. OK I'm beginning to fell like I am trying to justify going to this picture as opposed to reviewing it. So lets go. Let me start by mentioning that I absolutely detested all of Emmerich's earlier risks behind the camera most of all, Godzilla, The Day After Tomorrow and of course Independence Day. I could write a book on how much Independence Day insulted my and everyone else's' intelligence. However it like 2012 were huge at the box office, so I guess we get what we deserve. Well as previous reviewers mention the casting and acting are acceptable. given the cornball script. More on that later. First the plot. I think given the topic we can afford a few breaks on the plausibility meter. Walking into this film you expect and hopefully look forward to a steady diet of visual effects. For those that know me I always preach that when someone puts this much effort and money into a film it really deserves to be seen by all. My theory behind this statement is that without an audience, directors like James Cameron would cease to take the risk on producing blockbusters. Once I have my thirst quenched on well written thoughtful independent films, I still like to occasionally go to the theatre to see a mind blowing spectacle. Now 20 minutes into this beast I was reevaluating this loyalty. For every Michael Mann we get a Michael Bay. So the key is to know at which Micheal you want to throw your money. My advice is stick with the 'Mann'. The visuals are many and impressive. We certainly gets our money's worth. Where we are cheated however is the lack of seriousness the films gives the scenario of global annihilation. The crazy part is that I think the film is actually trying to take itself seriously. However with the characters' plethora of unrealistic reactions to the horrors that unfold in the plot we have Emmerich falling a tectonic chasm short on realism. Now for the victims of the script. We have the always entertaining Woody Harrelson reduced to a crack-pot conspiracy theory radio host that in the face of certain death acts like an idiot. Yes the script of 2012 made the mostly cutting edge Woody Harrelson look like an idiot. Now my pal John Cusack pulls off his best David Blaine imitation by actually walking away from this picture by not looking like a fool. Hats off as I am sure it was no easy feat navigating through the disastrous script. Then there was other characters that we had to endure like the billionaire Yuri's girlfriend (believe me I'm doing her a favour by not looking up her name) who has absolutely no place or purpose other than annoying us Jar Jar Binks style. Out of respect for fine actors link Danny Glover, Amanda Peet, Chiwetel Ejiofor and cutey Thandie Newton, I will plead the fifth on their part in the 2012 experience. One other favourite of mine, Oliver Platt, deserves some props. Although he was expected to be the villain here, his presence and acting ability actually allowed him to come off as the only person I would want to associate myself with in the face of a catastrophic emergency. Now another thing that bugged the hell out of me was the ridiculous exchange between characters. On numerous occasions loved ones picked up the phone to have their last conversation with loved ones as mountains of water rush towards them or rubble falls at their feet. The apoplectic affect of these scenes is that after sharing some touching sentiments and/or words of parting wisdom characters never (I mean not even once) properly finished their conversations and just dropped the call with an apparent sudden loss of words or a strong urge to brave their death in solitude. Perhaps they should have went with Verizon. Now I don't have enough time or scientific venacular to properly brief you on the obvious technical glitches of this movie, but I will direct you to a fun read that compiles these for us at http://www.imdb.com/title/tt1190080/goofs. 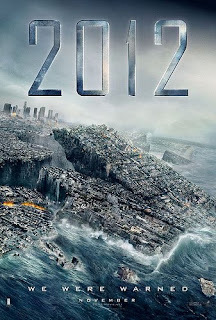 I guess once December 21 comes and goes and we are all safe and sound in our living rooms we may conclude that worse then getting the end of times right, the Mayans true sin upon humanity was having a hand in feeding Emmerich the plot to 2012. To their credit they did not have to live to experience it. So in closing, like with all threats of impending death stay clear.